'Dream crazier' scored higher among both men and women in data from Realeyes. 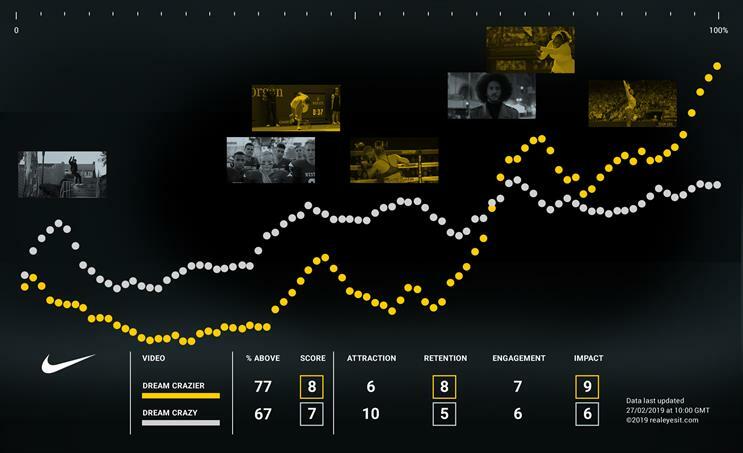 Nike’s latest ad, "Dream crazier", which features a voiceover by Serena Williams and celebrates female athletes who have broken barriers, has outstriped its predecessor, "Dream crazy", in a study of emotional engagement. "Dream crazy" featured Colin Kaepernick, who has in effect been blacklisted by NFL since he began kneeling during the US national anthem in protest at police brutality. Both ads were created by Wieden & Kennedy Portland. Realeyes used artificial intelligence emotion-tracking tools to test the two spots with 500 US adults and found that "Dream crazier" performed better among both women and men, with the difference especially marked among men. "Dream crazier" scored eight out of 10 overall in Realeyes’ EmotionAll measure, compared with seven out of 10 for "Dream crazy". The new ad also scored higher on engagement (seven versus 6), retention (eight versus five) and impact (nine versus six), although it scored lower on attraction (six versus 10). Among women, both spots received an overall score of eight out of 10, with "Dream crazier" performing slightly better. Among men, the Williams ad scored seven, compared with six for the Kaepernick spot. 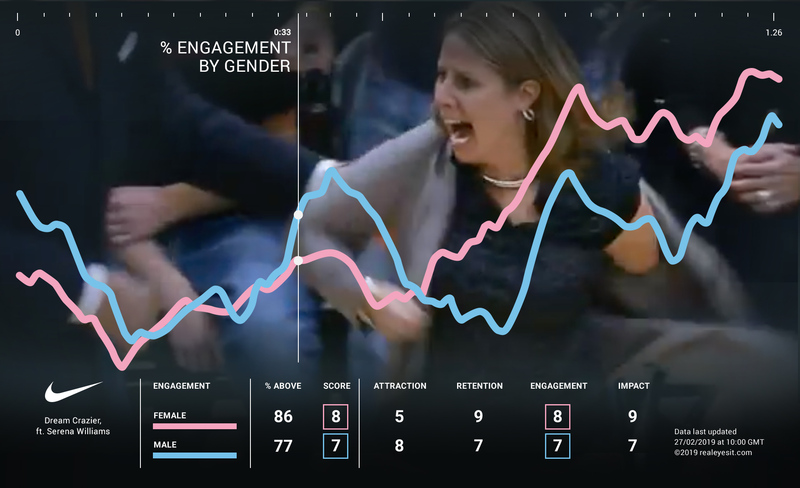 The time graphs of how engagement changes over the duration of each ad also reveals differences in how men and women responded to specific moments. In Williams’ ad, men were most engaged at points of high passion, such as when the player critiques accusations of women being "hysterical". But male engagement dips when she talks about equal opportunity and playing with men. Female engagement, meanwhile, grows much more evenly throughout the film. 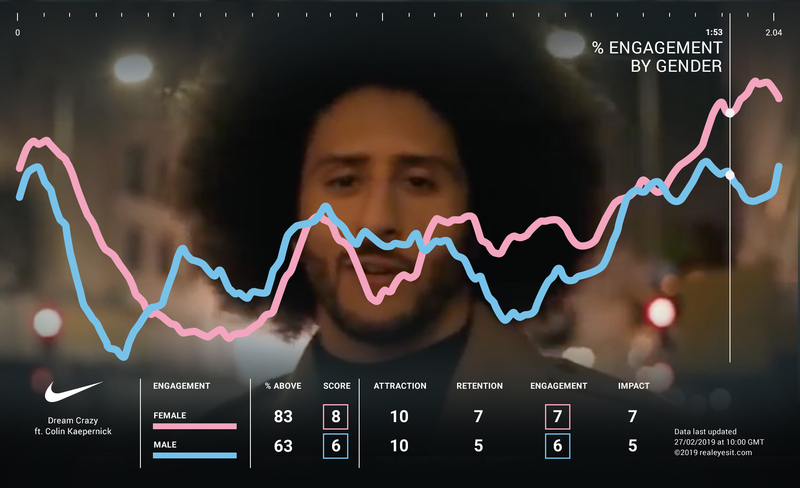 The response of men and women also diverges in the Kaepernick ad, but not as significantly. The tennis player’s spot also produced far fewer polarised comments from participants in the study, reflecting the controversy around Kaepernick. Colin Pye, creative director at Realeyes, said that the response to Williams was notably more positive in the new ad than in the previous one, in which she appeared alongside numerous other athletes. "‘Dream crazy’ was released around the time of Williams’ controversial outburst at the US Open final last year, which may have affected the way people reacted to her," he said. "In fact, the negative emotional responses to her on screen were even more pronounced than when Kaepernick was on screen. However, with 'Dream crazier’, the response to her is a lot more positive." Pye added that the new ad appeared to have taken on board factors of how the Kaepernick spot was received, because it is 30 seconds shorter and features a more positive soundtrack, more positive delivery of narration and a higher frequency of brand exposure.